Thrifty LA car rental offers all the great brands you would expect from a rental company. The difference noticed are often in the price associated with renting the vehicle for one day, weekly, or long term. Thrifty LA car rental adds deals on their website for their loyal customers that want to find the best deals available. Even though these deals can change the latest ones, include a compact car for $25.99 per day, premium car for $32.99 per day, and a Midsize SUV for $29.99 per day. You will not only find great deals on Thrifty LA car rental by visiting their website but even deals from their partners such as earning bonus miles such as renting any car for three days and receive 500 bonus miles as an example. 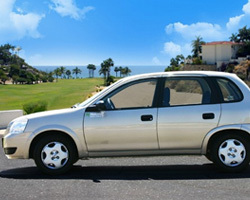 Thrifty LA car rental offers four locations in and around Los Angeles, California. The company also has locations throughout the United States for those needing a one-way rental. Thrifty LA car rental divides their vehicles into categories like all the other rental companies. These categories offer different vehicles or ones similar to the ones listed. The examples given are for customers picking up and dropping off at Los Angeles International Airport and may not be the same at the time of rental. The Chevrolet Aveo (Economy) is $48.44/day or $132.04/week, Ford Focus (Compact) is $48.44/day or $145.34/week, Dodge Avenger (Mid-Size) is $49.87/day or $151.99/week, Ford Fusion (Standard-Size) is $52.34/day or $162.44/week, Dodge Charger (Full-Size) is $55.09/day or $170.99/week, and the Ford Crown Victoria (Premium) is $84.07/day or $411.91/week. For looking for a larger vehicle Thrifty LA car rental offers a Ford Escape (SUV) for $66.02/day or $164.91/week and a Dodge Caravan (Van) for $59.49/day or $274.49/week. Thrifty LA car rental also has a Mustang convertible with rates of $85.02 per day or $370.97 per week. The cars listed above may not be the actual vehicle available as the website does say or similar. The prices are not guaranteed but are examples to help you make an educated decision on which prices and company fits your car rental needs.